Graphic artist Storm Thorgerson, whose album cover artwork included Pink Floyd's The Dark Side Of The Moon, has died aged 69 following a battle with cancer, the band's management announced. A long-term collaborator with Pink Floyd and a childhood friend of its members, Thorgerson also created covers for multi-million selling albums by Led Zeppelin, Muse and Peter Gabriel. A statement on Pink Floyd's official website read: "We are saddened by the news that long-time Pink Floyd graphic genius, friend and collaborator, Storm Thorgerson, has died. Our thoughts are with his family and many friends." 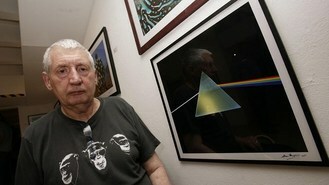 Dave Gilmour, the band's vocalist and guitarist, added that the designs Thorgerson created for Pink Floyd were "an inseparable part of our work". He said: "We first met in our early teens. We would gather at Sheep's Green, a spot by the river in Cambridge and Storm would always be there holding forth, making the most noise, bursting with ideas and enthusiasm. "Nothing has ever really changed. He has been a constant force in my life, both at work and in private, a shoulder to cry on and a great friend. I will miss him." Thorgerson died peacefully surrounded by family and friends, according to a statement released by his family. "He had been ill for some time with cancer though he had made a remarkable recovery from his stroke in 2003," it said. "He is survived by his mother Vanji, his son Bill, his wife Barbie Antonis and her two children Adam and Georgia." Storm Thorgerson was trending on Twitter within an hour of his death being reported, with users remembering images such as the light refracted through a prism which illustrated the 1973 Dark Side Of The Moon and a man covered in lightbulbs for the live album Delicate Sound Of Thunder. Other notable - often surreal - works included images of people hanging upside-down in a desert landscape for Alan Parson's 1993 album Try Anything Once and two onions with women sprouting out of them for Umphrey's McGee's The Bottom Half.